Welcome to the West Seattle Bee Garden ! 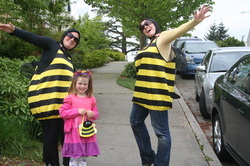 Come visit our bees in West Seattle - in the High Point Commons P-Patch at Graham & 31st Ave. SW! You are welcome anytime. Watch the bees fly in and out of their hives, and read up on the educational facts about these amazing creatures. Sit down on our benches and take in the wonderful open space of the park, pollination garden, and surrounding P-Patch. Want to plan a field trip to the Bee Garden? Field trips generally begin with a 15 minute talk about bees and pollinators, followed by questions and answers. There is so much information to share about honey bees and pollination. At a minimum, we try to cover the different types of honey bees and the different roles they play in the hive (honey bees are a great example of teamwork! ), what pollination is and why it is important for our food supply and ecology, and how we can help the bees. Afterward, the beekeeper is able to put on their beekeeping gear, go inside the enclosure, and open the hives. Participants are able to see the bees, honeycomb, nectar, honey, pollen and larva up close through the plexiglass walls of the enclosure. Nearby benches are able to accommodate seating for groups of 30. It is good to limit group sizes to about 30-35 so that everyone can see the bees. It is possible to host multiple classrooms during the same trip via rotations through the bee garden. 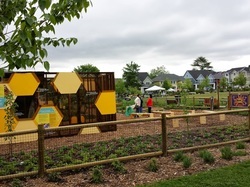 Other activities that work well in the area are exploring the surrounding pollination garden and P-Patch (perhaps include an activity to identify the plants, or parts of the plants - linking the role of pollinators and pollination), arts and crafts in the grass, play on the playground, or eat lunch under the shade of a tree or at the nearby amphitheater. Each presentation plus demo tends to last about 30-45 minutes depending on the number of questions from the group. Exterior bathrooms are available at the High Point Neighborhood House (at the south end of the park) on weekdays. These bathrooms are often locked on weekends. Please plan accordingly. There is no mandatory cost for field trips, although we do accept donations to help support maintenance of the bees and garden. If possible, our suggested donation is $1/person. A donation link can be found on our homepage. Also, checks can be mailed to our GROW (formerly P-Patch Trust) account - please include the West Seattle Bee Garden in the 'for' portion of the check to ensure it is deposited into our account. GROW is a certified non-profit organization, and donations made to this account are tax deductible. To schedule a field trip, please email westseattlebeegarden@gmail.com. Please include the size and age range for your group, and we will do our best to accommodate a date and time to meet. Demand for field trips has grown every year - we recommend scheduling your trip early to ensure a spot. We may ask to combine small groups to minimize disturbance to the bees. The best months to visit the bees are May through September - although, depending on the weather, we have hosted field trips in March and October as well. We may need to reschedule field trips for cold weather or rain (can't open the hives in these conditions). Our beekeeping, presentations and garden are volunteer run. We enjoy sharing the space and our knowledge with you and your groups. Click here for some recommended reading and activities to help prepare for your trip! Can't come to the Bee Garden, but want to learn more about bees from a Beekeeper? We are fortunate to have wonderful beekeeping friends from the Puget Sound Beekeepers Association who are able to visit groups and classrooms! PSBA beekeepers are equipped with great information, pictures, beekeeping gear, and perhaps even an observation hive. To learn more or schedule a visit, please email volunteer4psba@pugetsoundbees.org. basketball court, amphitheater and Neighborhood House.